Think your kitty can’t love his cat carrier? We’ve turned to an expert for five easy on how to train your cat to like going in his crate. 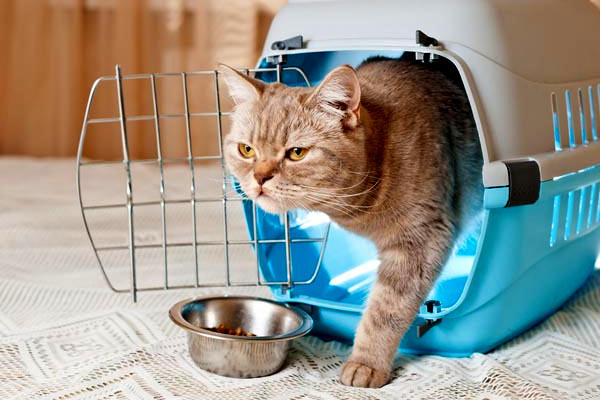 You may be living with a cat who will do everything possible to avoid being within spitting distance of a cat carrier. She may be one who, as soon as the monstrous object looms into sight, disappears, hiding for days. Or she might be one of those little ones who seems to use Velcro to plant her paws firmly on the carrier sides, making it impossible to maneuver her into it. Another common experience many cat parents share is chasing cats around the house. Wrestling cats into carriers often morphs into trauma and stress — vet appointments are missed, and cats do not receive medical attention. My cat Maulee was a drama queen around carriers. She had a chronic illness, which meant frequent trips to the vet — sometimes one or two times a week. Lucky me! I knew what I was signing up for when I adopted the seven-year-old cat, but what I did not predict was her intense hatred for all things vet, including pet carriers. At the first sight of one, she became a ghost cat— squeezing herself into hiding places that I did not know existed. Sometimes she transformed into a Cujo Cat, ready to lash out at anyone who approached her. Maulee is not unique. Yes, you can convince your kitty to love his cat carrier! 1. Get the right cat carrier. I recommend hard-sided carriers. Most have tops that are removable, making it easier for veterinarians to examine cats. The top and bottom pieces attach to each other with either large latches or screws. I find that kitties acclimate faster to hard-sided pet carriers because the cats feel more secure in a rigid carrier. When using this type of carrier, make sure that the fasteners are securely in place after assembling it. Carriers should be large enough for cats to stand up and turn around in and should not smell like other cats. The feline sense of smell is very acute. The scent of other cats can cause them to become stressed and anxious. Ideally, carriers should be new, but because that is not always possible, used ones should be thoroughly washed. 2. Make cat carrier a part of your furniture. Many people habitually stash cat carriers in closets or the garage until the dreaded day when they need to transport their cats somewhere. Instead of treating carriers like holiday ornaments that are brought out once a year, carriers should become furniture and placed in areas cats enjoy hanging out in. It is easier to change cats’ negative feelings about carriers if the carriers become an integral part of their world. 3. Ensure your cat’s crate is a cool place to hang out. You can change your cat’s scary relationship with her carrier by making it into a comfortable and fun place to hang out. The first step is to take the door off the carrier. Place an item of clothing scented with your cats’ favorite person’s smell inside of it. You can also pet your kitty with a towel and line the bottom of the carrier with it. Familiar, comforting scents will help reduce her stress and make the carrier a little less scary. Play and food work wonders! Put a treat your cat adores near the carrier. After she eats it, give her another one, this time placing it closer to the entrance. Gradually decrease the distance until she has to reach her paw or head in the carrier in order to retrieve the coveted treat. Encourage her to venture further in by tossing treats into the back of the carrier. Some cats can also be persuaded to eat their meals in it as well. Do not insist. It is important that your cat feels secure enough to venture in and out on her own. Play can also help turn a cat’s opinions. Encourage your cat to play around the carrier by dragging the object at the end of a pole toy around and on top of the carrier. Cats caught up in fervor of play will often chase their favorite toys and ping-pong balls into the carrier. 4. How to deal with a cat who truly hates his carrier. Your cat may not be easily persuaded to change her perception of carriers. Help change her opinion by taking it apart. Unlatch and remove the top and convert the bottom into a place she can play, sleep, and eat. After she is freely going into the bottom of her carrier, reassemble it and continue the activities. 5. Step up the amount of time your cat spends in his crate. Reinstall the door after your cat accepts the carrier. She may take her afternoon naps or eat snacks in it. Leave the door open and continue to encourage her to enjoy her visits. While she is in the carrier, close the door and then open it again. Increase the time the carrier door is closed by one second each time. After opening the door, give her a treat, reinforcing her good feelings about the carrier. Continue to work with your cat, gradually increasing the criteria until you can pick up and carry her in the pet carrier without complaint. Do not hurry the process — cats are individuals. Some change their perceptions about cat carriers in about a week. Others need a few weeks or a couple of months until they no longer hate them and have no issues with going in them. It does not stop there. With clicker training and practice, you can teach your cat to open the carrier, go in and close the door behind her. Find the Cat Coach on Facebook! Cat not comfortable with carrier but will go in. Trouble is, during journey we have a huge dollopy poop which entails giving the creature a bath to clean up. Only journeys undertaken are from home to parents who care for her when I need to be away, where she settles within minutes, and then from there back home here. How can we stop this?? My cat Trevor AlWAYS pees and poops in the carrier. I bought a larger carrier and put a small flat bed in front and a pee pad cut to size in back. I got him used to the pee pad by putting a cut to size pee pad in about a quarter of his litter box (he now will use an empty litter box with just a pee pad – good for emergency!) Of course if you get a LARGE carrier you could always put a very small litter box in it :). looks good! we can pick him up and put him in the carrier but it takes like 10 mins still, this might work as we recently found a treat my fat huge black cat just adores! lol, will try it out! Great list. I definitely need to try these things with Beau, he still haaates his carrier.